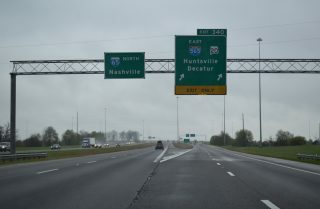 Interstate 565 constitutes a freeway leading east from I-65 and U.S. 72 Alternate at the city of Decatur Madison, Huntsville and U.S. 72 across Chapman Mountain. 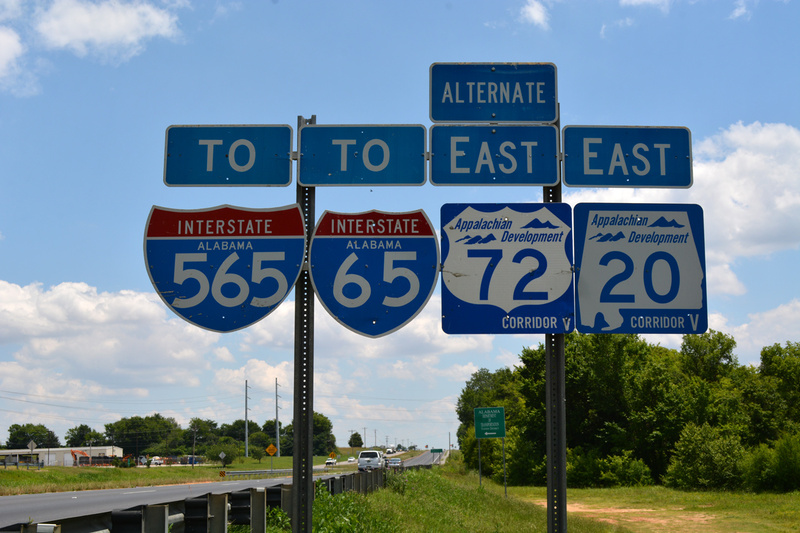 I-565 directly replaced portions of U.S. 72 Alternate and Alabama 20. 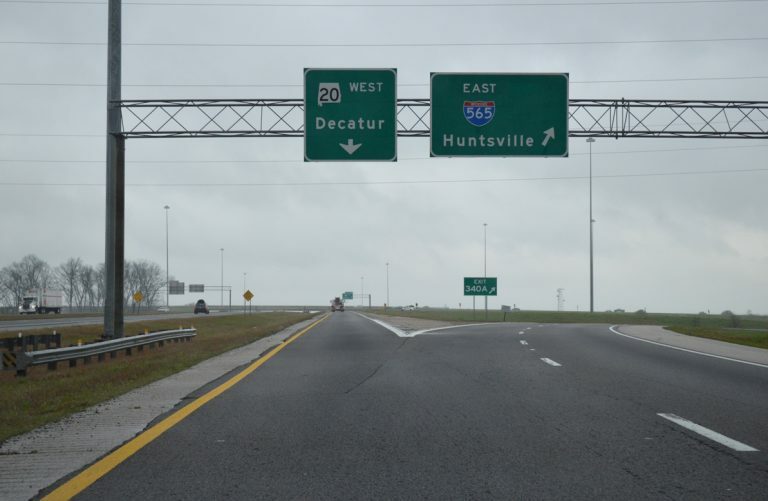 Completion of the freeway fueled growth in the Huntsville area in conjunction with research at NASA’s Marshall Space Flight Center and the Redstone Arsenal. ALDOT officials planned a three-mile extension of Interstate 565 eastward over Chapman Mountain to a new split-diamond interchange at Moores Mill and Shields Roads. Construction of the $21.5 million project was slated to start in 2007.1 Work was shelved however and subsequently reevaluated. $9.4-million in construction from December 2013 to April 10, 2015 added two ramps at Interstate 565 and County Line Road.9 These movements complimented the adjacent wye interchange with Madison Boulevard. Interstate 565 is part of High Priority Corridor 7: U.S. 72 and High Priority Corridor 11: ADHS Corridor V.
A westward extension of the limited access highway from I-65/565 to the U.S. 31 bridges over the Tennessee River was previously considered. 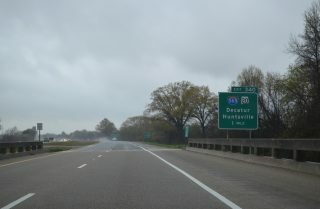 The Fiscal Year 2005 Federal Transportation Department appropriations bill passed by Congress on November 20, 2004, included $3 million to begin efforts to extend Interstate 565 west to Decatur.3 Further funds were identified in the SAFETEA-LU legislation that was signed by President Bush in August 2005. Interstate 565 directly overlaid or replaced U.S. 72 Alternate between Decatur and Huntsville. The North Huntsville bypass (SR 255) would have provided traffic relief to U.S. 72 across Chapman Mountain. Only the west leg of SR 255, between I-565 and SR 53, was constructed as a full freeway. Leaving Oakwood Avenue, Interstate 565 continues another mile to a folded diamond interchange (Exit 21) with U.S. 72 (Lee Highway) west and Maysville Road south. Photo taken 06/10/17. Climbing onto Chapman Mountain, Interstate 565 reaches the loop ramp (Exit 21) for U.S. 72 (Lee Highway) west to Sparkman Drive and U.S. 231/431 (Memorial Parkway). U.S. 72 east merges with the ending freeway ahead of Epworth Drive. Photo taken 06/10/17. An end shield stands along U.S. 72 eastbound ahead of the service road to adjacent Epworth Drive and High Mountain Road. Photo taken by Jason Ilyes (05/09/04). Interstate 565 eastbound originally concluded beyond the interchange (Exit 20) with Oakwood Avenue. 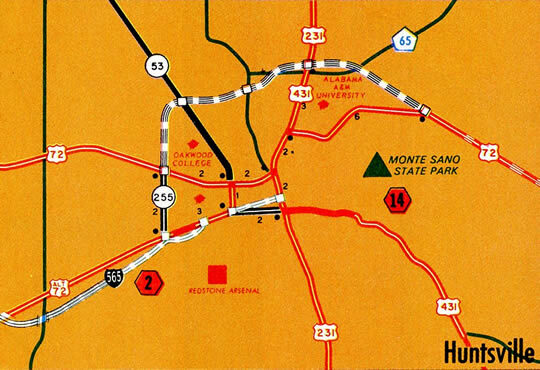 A series of end signs preceded the wye interchange along the elevated viaduct leaving Downtown Huntsville. The “end” and distances were eventually concealed with overlays.4 Photo taken by Chris Patriarca (01/26/03). Eastbound Interstate 565 at Exit 20 to Oakwood Avenue. The Jackson County seat of Scottsboro is 41 miles to the east. Photo taken by Chris Patriarca (01/26/03). The Interstate 565 viaduct and freeway designation concluded ahead of an at-grade intersection with U.S. 72 (Lee Highway) west at Maysville Road. Photo taken by Chris Patriarca (01/26/03). U.S. 72 ascends over Chapman Mountain through Certain Gap ahead of the split with Interstate 565 at Exit 21. Photo taken 06/10/17. An at-grade intersection with High Mountain Road and Epworth Drive precedes the folded diamond interchange (Exit 21) with U.S. 72 west and Maysville Road. Photo taken 06/10/17. The third lane added along U.S. 72 westbound over Chapman Mountain defaults onto the continuation of Lee Highway to Sparkman Drive in Huntsville. U.S. 72 Alternate begins and overlays all of I-565 west to I-65 and SR 20 at Decatur. Photo taken 06/10/17. Button copy overhead for U.S. 72 west posted at the turn lane for Lee Highway ahead of the then-signalized intersection with Maysville Road. 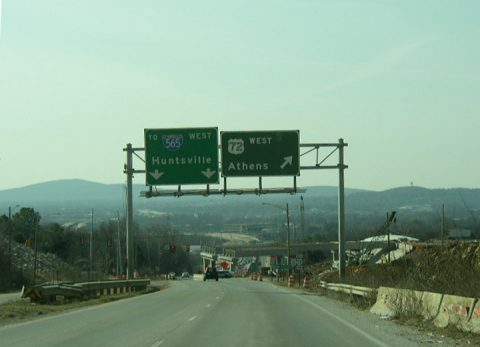 U.S. 72 leads northwest from Huntsville and Madison to Athens. Photo taken by Chris Patriarca (01/26/03). The previous westbound beginning of Interstate 565 was located at Oakwood Avenue and Andrew Jackson Way (Exit 20). Photo taken by Chris Patriarca (01/26/03). Interstate 565 crosses Limestone Creek two miles ahead of I-65. The freeway spur concludes at five miles to the east of the Decatur city center. Photo taken by David Prince (03/21/16). All traffic to Interstate 65 departs Interstate 565 in unison at Exit 1. U.S. 72 Alternate continues along side SR 20 west from the freeway end to Downtown Decatur and Muscle Shoals. Photo taken 06/10/17. Drivers bound for Birmingham or Nashville depart Interstate 565 & U.S. 72 Alternate at Exit 1. Although signage indicates that Interstate 565 continues onward, the designation concludes on the west side of the exchange. Photo taken 06/10/17. A directional ramp leads southbound from I-565 west to I-65 south, 74 miles north of Birmingham. Nashville, Tennessee is 101 miles northward. Photo taken 06/10/17. 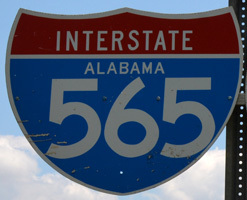 An Interstate 565 ends sign marks the western end of the freeway. U.S. 72 Alternate & SR 20 proceed west 2.5 miles to merge with U.S. 31 south at a wye interchange ahead of Wheeler Lake. Photo taken by David Prince (03/21/16). U.S. 72 Alternate and Alabama 20 approach the three quarter cloverleaf interchange with I-65 and I-565 east. This use of this “controlled access highway ” signage is unique to Interstate 565 within the Heart of Dixie. Photo taken 06/10/17. Exit 1A leaves U.S. 72 Alternate & SR 20 east for Interstate 65 southbound to Birmingham. I-65 crosses the Tennessee River on the seven mile drive to Priceville and the succeeding exit with SR 67. With all references to the overlap along I-565 removed east of I-65, SR 20 concludes here. Photo taken 06/10/17. Exit 1B loops from I-565 & U.S. 72 Alternate east onto Interstate 65 north. I-65 ventures 26 miles north through Athens to Ardmore and the Tennessee state line. Photo taken 06/10/17. Interstate 65 traverses Wheeler National Wildlife Refuge north of the Tennessee River and Limestone County line. I-565, U.S. 72 Alternate & SR 20 lie one mile to the north. Photo taken 06/10/17. Interstate 565 east serves Redstone Arsenal and the NASA Marshall Space Flight Center in addition to Huntsville. Various technological weapons for the U.S. Military are developed at the arsenal. Photo taken 06/10/17. A collector distributor separates from northbound I-65 for I-565 east to Huntsville and U.S. 72 Alternate and SR 20 west to Decatur. Photo taken 06/10/17. 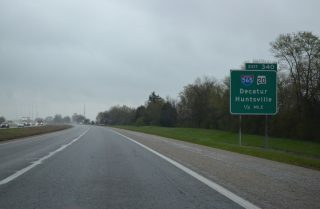 A two-lane ramp (Exit 340A) departs the c/d roadway for Interstate 565 east to Madison and Huntsville. Photo taken 06/10/17. Interstate 65 parallels Piney Creek southward on the two mile approach to Interstate 565 east, U.S. 72 Alternate and Alabama 20 west. Photo taken by David Prince (03/20/16). Spanning a Norfolk-Southern Railroad line, one mile north of the cloverleaf interchange (Exit 340) with Interstate 565/U.S. 72 Alternate on I-65 south. Photo taken by David Prince (03/20/16). 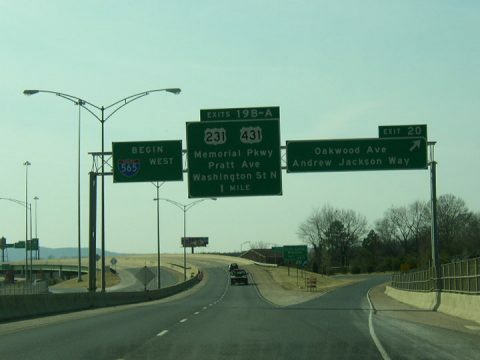 Although the first off-ramp from the north, Alabama 20 & U.S. 72 Alternate west is signed as Exit 340A instead of 340B. The Morgan County seat of Decatur is just a five minute drive to the southwest. Photo taken by David Prince (03/20/16). A loop ramp (Exit 340B) joins I-65 south with Interstate 565 & U.S. 72 Alternate east to Mooresville, Madison, Huntsville International Airport (HSV) and Huntsville. The city limits of the “Rocket City” extend this far west, though Downtown is 19 miles away. Photo taken by David Prince (03/20/16). 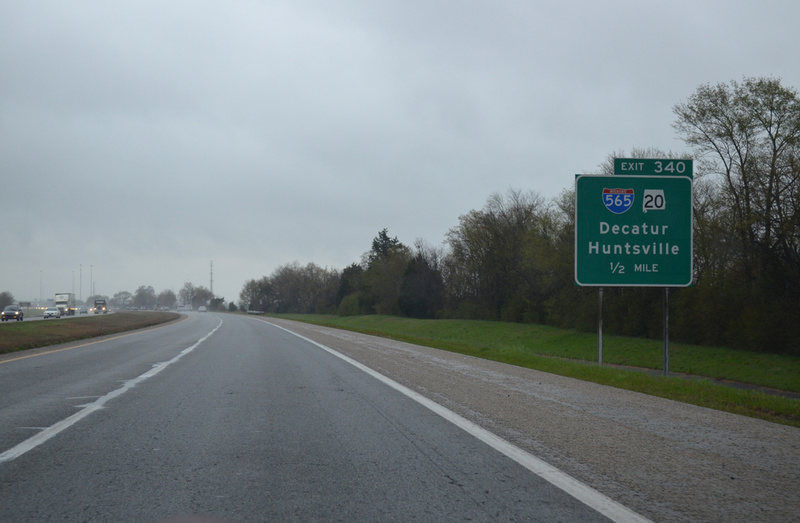 All guide signs for Exit 340 were replaced with Clearview font based assemblies by 2015. Photo taken 04/04/13. A greenout for "East" covers "North", as the freeway was initially posted with north/south directions to benefit motorists to and from Birmingham.6 Photo taken 04/04/13. 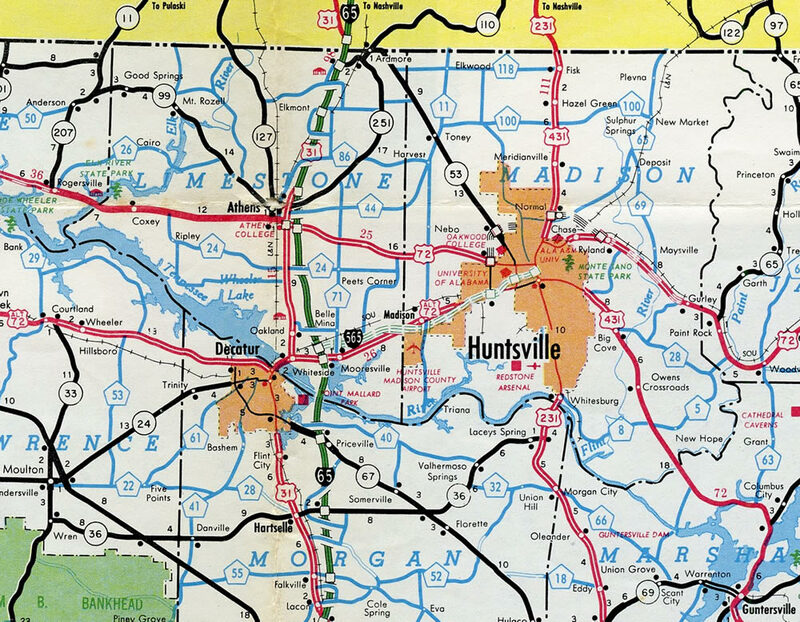 “I-565 could go beyond Shields Road.” Huntsville Times (AL), August 15, 2004. Lamb, Daniel. “I-565 Exit 21 Now Open.” Online posting, Yahoo Groups – Southeast Roads and Transport, May 17, 2004. 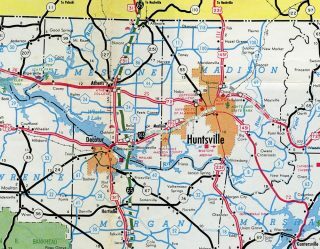 “Appropriations bill includes $3 million for I-565 extension: Money to be used to stretch road west toward Decatur”http://www.al.com/news/huntsvilletimes/index.ssf?/base/news/1101204900271040.xml in Huntsville Times, November 23, 2004. Philip R. “I-269 broken link / I-565 info and question / I-69 MS info.” Personal Email, 1/18/08. “Confusing signs to be changed.” Gadsden Times (AL), December 18, 1991. “The Interstate System.” Tuscaloosa News (AL), September 21, 1969. “Change of plans for U.S. 72 project at Moores Mill, Shields roads.” The Huntsville Times (AL), December 13, 2011. “Driving You Crazy: Hwy. 72 & Chapman Mountain.” WHNT (Huntsville, AL), October 21, 2015. “County Line Road, I-565 interchange to open Friday.” Decatur Daily (AL), April 9, 2015. “New I-565 interchange is big win for Town Madison shopping complex.” The Huntsville Times (AL), September 4, 2015. “New I-565 interchange approved for Madison.” WHNT (Huntsville, AL), August 28, 2015. Page updated February 27, 2019.